Dhaka – Authorities in Bangladesh have sealed off the eastern border with Myanmar after fresh influx of people from ethnic groups amid violence in Chin state of western Myanmar. Foreign Minister Abul Kalam Abdul Momen told reporters in Dhaka that the government had ‘almost sealed’ the border to prevent new arrival of people from Myanmar, where fresh violence has been reported. “We’ve almost sealed off the border,” he said after a meeting with visiting Hollywood actress Angelina Jolie at his office. More than 200 Buddhists from Chin state of western Myanmar have reportedly fled an intensified fighting between security forces and insurgents. The minister was informed that ethnic and religious groups, including Buddhists and Hindus, have been trying to cross into Bangladesh for safety. “We had kept our border open for adequate people. We won’t take anymore,” the Momen said referring to influx of more than 700,000 Rohingya Muslims after the military crackdown in August 2017. Bangladesh has altogether been hosting more than 1 million refugees who fled violence in Myanmar. Jolie, a special envoy of the United Nations High Commission for Refugee, arrived in Bangladesh on Monday to assess the humanitarian response as aid agencies prepared to appeal for 920 million dollars to meet the basic needs of the refugees sheltered in south-eastern Cox’s Bazar district. She urged Myanmar, which has been playing dray and duck over the ethnic group’s repatriation, to show genuine intend to take the persecuted Muslims back to their homes in dignity. A local government official in Bandarban district, neighbouring Cox’s Bazar, said more than 40 Buddhist families from Myanmar’s Chin state crossed into a remote Bangladeshi village on Monday. They have been sent to temporary tents in Chai Kayang para of Ruma sub-district, Shamsul Alam, Upazila Nirbahi Officer of Ruma told reporters. The newly arrived people told a village headman that they were forced to cross the border to save life as fighting between the Myanmar military and the Arakan Army, an insurgent group in Myanmar, was intensified in the last couple of weeks. 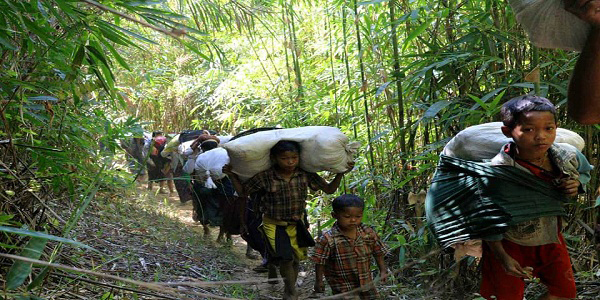 Jira Bawm, chairman of Remakri Prangsha union said the displaced people arrived on Monday evening. They wanted to travel to the Upazila headquarters, but the law enforcement agencies prevented them from doing so. Troops from paramilitary Border Guard Bangladesh were put on alert on the eastern frontier.